Heat oven to 350°F. Grease bottom only of 13x9-inch pan. In large bowl, combine all brownie ingredients; beat 50 strokes with spoon. Spread in greased pan. Bake at 350°F. for 28 minutes. Remove from oven. Meanwhile, in small bowl, beat 1/4 cup butter and brown sugar until light and fluffy. Add 1 egg, 2 teaspoons coffee granules and 1 teaspoon vanilla; blend well. In medium bowl, combine walnuts and chopped chocolate. Add brown sugar mixture; blend well. Spoon and carefully spread filling over baked brownies. Return to oven; continue to bake an additional 17 to 20 minutes or until light brown. In small saucepan, melt chocolate chips and 1 tablespoon butter over low heat, stirring constantly until smooth. Remove from heat. With wire whisk, stir in 1/8 teaspoon coffee granules and enough milk for desired drizzling consistency. 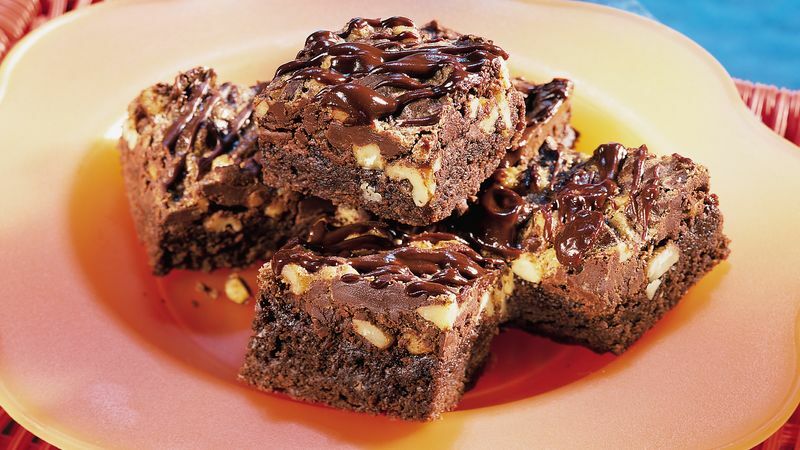 Drizzle over warm brownies. Cool 45 minutes or until completely cooled. Cut into bars. These triple espresso brownies are true to their name: there are three layers to these sweet squares, and each layer gets a delicious boost from instant espresso. Why espresso, you ask? For the serious chocolate fans out there, using strong coffee or espresso in desserts enhances the flavor of the chocolate (now that’s a partnership we can get behind!). In the case you have leftovers, you can store these brownies in a tightly sealed container for three to four days. Want to try your hand at some more brownie recipes? We have plenty for you to choose from!